GIRLFRIENDS’ GUIDE TO DIVORCE will return for its second season on Tuesday, December 1st at 10 PM, Bravo announced. So what’s in store for season 2? Bravo teases, “as a new chapter in Abby’s professional life seems promising, her personal life remains chaotic and all-consuming as her adventures in dating become even more unpredictable. “When she becomes ‘the face of divorce’ for chic lifestyle website SheShe, Abby is once again forced to live a lie hiding her complicated relationship with estranged husband Jake (Paul Adelstein). But as Abby finds success preaching the pros of divorce to her readers and portraying a fabulous single life on social media, she is torn over whether her marriage is worth saving or if she should chart her own course. Throughout Abby’s ups and downs, the one constant in life remains her incredible girlfriends. While Delia (Necar Zadegan) grapples with following the rigid traditions of getting married, Phoebe (Beau Garrett) tries to leave her demons in the past as she looks to find her true self and Jo (Alanna Ubach) deals with her ex-husband and his new wife encroaching on her new LA life. Things are looking up for GIRLFRIENDS’ GUIDE TO DIVORCE’s Abby — at least professionally. Fresh off of Abby’s agency approving her pitch to be more real with her writing, she lands a gig writing for the Huffington Post…where her first task is to date a whole lot of men in a short span. Bravo’s first scripted series, GIRLFRIENDS’ GUIDE TO DIVORCE, will part ways with planned series regular Janeane Garofalo, a source has confirmed. GIRLFRIENDS’ GUIDE TO DIVORCE stars Lisa Edelstein as Abby, a self-help author who initially tries to hide her separation from her husband (played by PRIVATE PRACTICE’s Paul Adelstein) in order to maintain her image. The series also stars Beau Garrett and Necar Zadegan. Garofalo was set to play Lyla, one of Abby’s closest friends. GIRLFRIENDS’ GUIDE TO DIVORCE is set to debut on Tuesday, December 2nd on Bravo. GIRLFRIENDS’ GUIDE TO DIVORCE creator Marti Noxon is a TV vet — some of the show’s she’s written for: BUFFY THE VAMPIRE SLAYER, GLEE, and PRIVATE PRACTICE — but what might be slightly lesser known is that she’s also wickedly funny. GIRLFRIENDS’ GUIDE TO DIVORCE — Bravo’s first original scripted series — will launch on Tuesday, December 2nd, the network announced during their Television Critics Association press tour session. The series stars Lisa Edelstein, who plays Abby, a self-help author who initially tries to hide her separation from her husband (played by PRIVATE PRACTICE’s Paul Adelstein) to maintain her image. The series also stars Janeane Garofalo, Beau Garrett, and Necar Zadegan. ORANGE IS THE NEW BLACK star Laverne Cox will guest star in an early episode of the series. Bravo’s first original scripted series, GIRLFRIENDS’ GUIDE TO DIVORCE, is getting a fun guest star for an upcoming episode: ORANGE IS THE NEW BLACK star Laverne Cox. GIRLFRIENDS’ GUIDE stars former HOUSE star Lisa Edelstein, who plays Abby, a self-help author who initially tries to hide her separation from her husband (played by PRIVATE PRACTICE’s Paul Adelstein) to maintain her image. 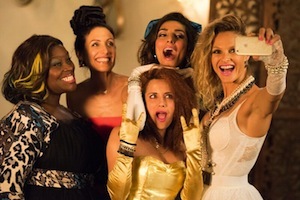 GIRLFRIENDS’ GUIDE premiere is still TBA. Are you excited to see Cox on GIRLFRIENDS’ GUIDE TO DIVORCE?